After going the first two rounds without a permanent captain, the Dingos Division 2 team have decided to name Alvin Ranchhod as the captain for the rest of season 2013. "The Division 2 team is really coming together nicely this year," said president Craig Stewart. 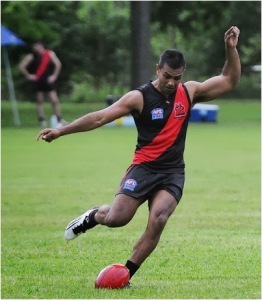 "Alvin is a great choice to lead this club to its first Div 2 flag. On behalf of the entire club, I want t congratulate him on becoming captain and know he will continue to move the team in the right direction." When Alvin, who loves to run and take a bounce or five, was told of his elevation to the role of Captain he had this to say: "I'm thrilled to lead the team out, but more so to teach the Canadians and Internationals the great game and develop them into potential Div 1 players. We play each week to win the flag but also to have a good time and provide the Dingos with depth and variety." Here's to a great season both on and off the field! Carn' the Dingos!